Today my brain is all foggy and I can barely keep my eyes open. Last night was an uncomfortable hot night. The AC was on but I still felt hot. Its probably around 4a.m. that I fell asleep and got up at 8 a.m.! That meant it was like a mad rush getting lunch ready, getting the washing machine started and all the usual chores before 10a.m. when the water disappears from the taps. I didn’t manage to beat the clock, some chores are left and will have to tackle them after 4 when the water returns. Many parts of Kenya have rainfall to the extend that floods are closing down roads, bridges and some places are impossible to get to. However, Mombasa is a different story altogether. Its still hot and whenever it does drizzle the weather becomes more humid and hot. 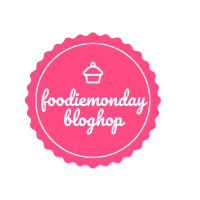 Considering that on hot days I just don’t want to have curries, dals and rotis, I decided to make something cold for our FoodieMonday/Bloghop Monday theme. #141 theme is YogurtBased suggested by Amrita who blogs at The Food Samaritan. Check out Amrita’s blog for beautiful clicks, lovely food styling and of course scrumptious food recipes. Cucumber and Yogurt are both very cooling and good to have during the hot season. Hubby was still hungry after sipping all the soup but I was a happy content person for an hour or so. On a serious note whether you want to consider this preparation as a savory smoothie, chilled soup or even a raita, its up to you. Whatever you call it, it was definitely a healthy and filling. 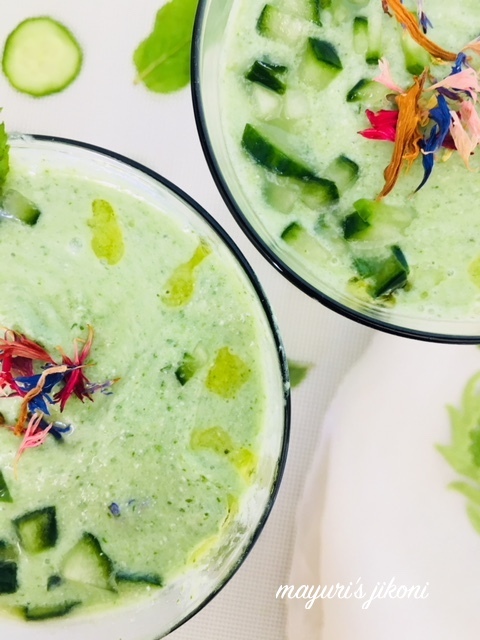 Here’s the recipe for a super cooling and tasty chilled cucumber and yogurt soup. Cut a quarter piece from the cucumber and leave it on the side. Cut the rest into chunks. Chop the coriander, mint, chili and garlic. Put it all in a blender including the cucumber chunks along with salt, lemon juice, sour cream and pepper powder. Process the mixture to a smooth consistency. Put it in the fridge for 1-2 hours to chill. Chop the quarter piece of cucumber into very fine pieces. To serve, spoon the chilled soup in a bowl or tall glasses. Add the chopped cucumber on top and drizzle some olive oil over it. Instead of sour cream can add some normal whipping cream. In that case increase the amount of lemon juice used. This chilled soup is perfect for this hot weather. Bookmarking your recipe . Thanks Preethi. Do try it as it is so delicious and filling too. Wow, that soup looks so creamy, refreshing and absolutely delicious. This is so perfect served chilled on a hot summer day. Hope you feel better soon. Thanks Pavani… back to normal now. They look absolutely delicious, loved the lovely green color, so soothing, perfect for summer time, will try them out soon! Thank you Meghna. Let me know how it turns out. This is the perfect dish for the kind of weather we now have in India.. Cool and refreshing. What a perfect soup for the summer, Mayuri! Your presentation and photos are very cool and inviting as well. How could I miss this post. Perfect drink to beat the heat. Loved the colour of the soup and your presentation Bookmarking it to try soon. Thanks Sujata. Do try it, its really delicious. Kinda summer drink, excellent to prepare and enjoy chilled during summer na.. Love these sort of chilled easy breezy soups while the weather is too hot. Thanks Priya and its a great filling drink…perfect as light lunch. Thanks Jolly, the colour is from the coriander, mint and the unpeeled cucumber. I had tried this some time ago and will vouch that this cucumber and yogurt soup is amazingly delicious. Lovely clicks Mayuri. 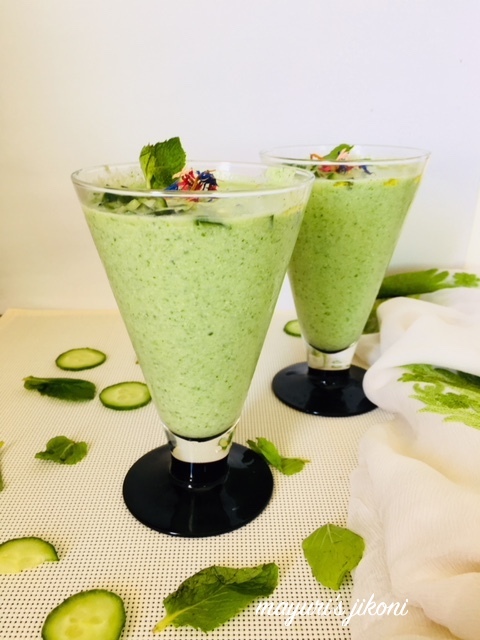 The chilled soup looks both refreshing and filling di..perfect for the weather here in Chandigarh..the vibrant green color also looks soothing and appealing . Thank you Poonam, the colour is from the mint, coriander and the unpeeled cucumber. Oh dear hope the weather improves, for us its pretty cool now as the rains have begun in Mombasa. Beautiful captures. Loved it. Summer needs definately such chilled treat.. Thank you so much Ruchi. 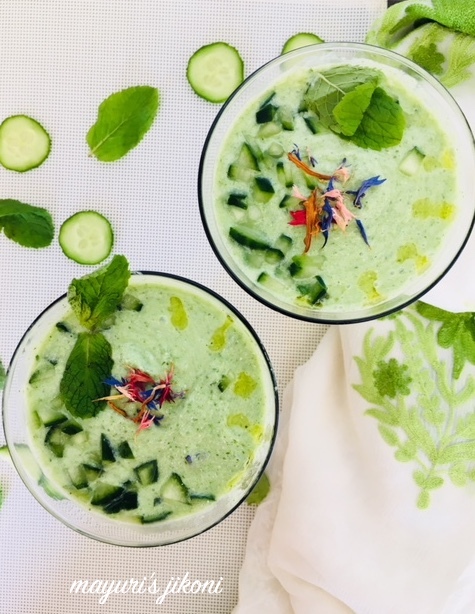 I love this cucumber and yoghurt soup, it’s apt for summer. Loved your clicks. That is one perfect way to use cucumbers in summers. Such refreshing and delicious soup ad I can finish all in one go. Thank you Sapana. Try out when you get those lovely tender English cucumber. Wow di, this soup looks so refreshing and perfect on these hot summer days. Awesome share !! Thanks Sasmita. It is a perfect summer treat. Ah wish I can grab that glass right now, cucumber and yogurt soup, sounds lovely in hot days. So refreshing and chilled. Thank you Jagruti, it truly is a cooler.